Vanderbilt University has announced the performers for its 15th annual Commodore Quake. 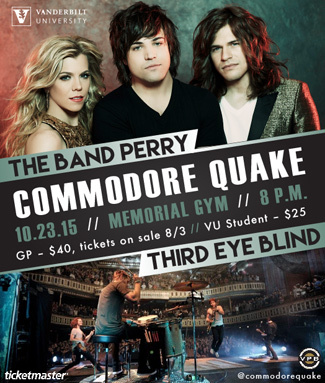 The Band Perry and Third Eye Blind will take the stage on Friday, Oct. 23, at 8 p.m. in Memorial Gym. The Band Perry is touring through the summer and fall, playing fairs, festivals and casinos. This week they are performing on a Carnival cruise ships. Tickets for the Vanderbilt concert will go on sale Monday, Aug. 3, at 10 a.m. Weekend passes for the general public are $40 in advance and $50 the week of the show. Students and staff can purchase discounted tickets. Tickets will be available at all Ticketmaster locations, online at www.ticketmaster.com. Tickets also can be purchased with no service fees at the Sarratt Student Center Box Office on the Vanderbilt campus.